This is a copy of Republic Act 10175 or Cyber crime Prevention Act 2012 that takes the freedom of expression via internet or computer. 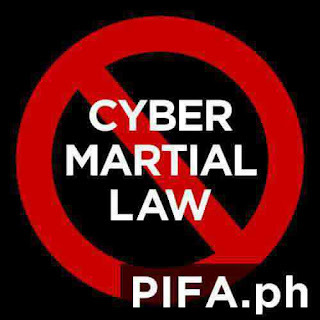 Netizens may charge to libel plus another label in up to 6yrs to 12 yrs imprison. The Cybercrime Prevention Act of 2012, which takes effect Wednesday, criminalizes identity theft, hacking, spamming, online trafficking and file-sharing. However, a couple of controversial provisions changed what could have been a standard law against illegal online activity into a potential way to gag free speech. A last-minute addition to the law prohibits online libel “committed through a computer system or any other similar means which may be devised in the future,” which allows a wide range of online activity to be interpreted as libelous. According to lawyers, bloggers, journalists and political activists, the vaguely worded law leaves too much room for interpretation, giving the government unprecedented control of the Internet. Anonymous Philippines Start Hacking Protest in government website by deface or DDOS attacks. TIPS: huwag niyong lagyan ng www. yung site ng mga gov dahil kapag linagyan ninyo ehh dadaan pa yan sa cloudflare, pero kapag di ninyo lalagyan ehh directly na yan sa server nila. Support AntiCyberCrimeLaw hashtag #AntiCyberCrimeLaw or in any social network put a Black Profile Pic.